Went off to college at Morehead State University for 4 years, got married in 1990 and then moved to Elizabethtown, KY, and then Bardstown, KY, and then Frankfort, Ky while working at PNC Bank in Louisville. 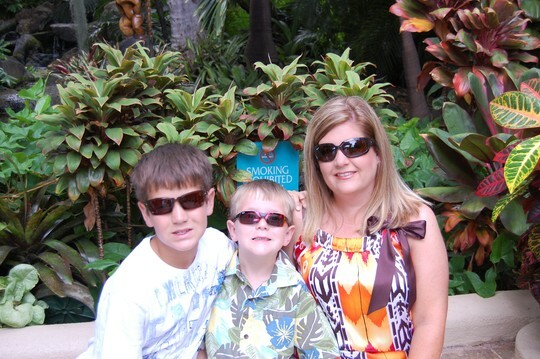 In 1995, moved to Coshocton, OH where we lived for 10 years (nice for a change) and had two boys, Bradley and Bailey. In 2005, we moved to Bentonville, Arkansas where we are today. Husband went to Virgie High School and then Morehead State also. Our boys, Bradley and Bailey are in the sixth grade and first grade. They both enjoy sports playing in the soccer, baseball, football and basketball youth leagues year round. Bradley will start Junior High next year in a class of 1,500 students. Boy, how things are different from where I went to school. I wish he could experience the small school atmosphere along with the safety and closeness of friends and family that comes with it. We love visiting Jenkins/Burdine whenever we can which usually amounts to 3 or 4 visits a year. My boys have never lived in Kentucky but I think they think they are from there too. They love the mountains and the hunting and fishing that they get to do with their grandpa and uncles. The also love the Wildcats and never miss a game. We always go to the UK vs. Arkansas games and sit on the Arkansas side (only tickets we can get) dressed in our Kentucky blue. All of my family (and my husband's family also) still live in and around the Jenkins area so my time is spent seeing family when we are there. I rarely see someone from high school but it is always nice to catch up when I run into someone. My fondest memories from High School are centered around the band! All the trips to away football games riding the band bus for what seemed like hours are now cherished memories. You could count on the annual band trip for a few new experiences and a source for unforgettable times spent with among classmates. Even after school field practices and summer camps were fun. Speaking of summer, loved spending hot summer days by the pool at the Country Club. Swimming, tennis, golf and the snack bar were all we needed for a fun filled summer of excitement! Teresa Thompson Burke has a birthday today. 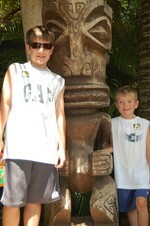 Bradley and Bailey with tiki statue in Oahu, Hawaii. Bailey is not the fisherman and opts to sleep when it comes to boating. We love to travel. Akaka Falls in Hawaii. Bradley's football team won the Bentonville Championship this year. He loves playing football. This is the final member of our family, Baxter, our King Charles Cavalier. Bailey becoming a surfer dude!